I’ve been re-living a cringe moment in my head the last few days. I don’t know what brings these old memories back to the surface, but when it happens, it takes days to shake it off. When I was in college, I taught yoga classes. The yoga classes were part of a general fitness program on campus that students could attend at the gym. Every semester, we held a promotional event where each teacher taught a quick 5-minute segment to introduce their class. Students were doing 5 minutes of kick boxing, followed by 5 minutes of step aerobics, then 5 minutes of belly dancing and so on. I was on the schedule to end the event with 5 minutes of relaxing yoga. I stood on the side of the stage, awaiting my turn and trying desperately to fit the head set on my head. Nothing labeled ‘one size fits all’ has ever fit me, so why would a head set fit around my petite head on this day? Suddenly, time ran out and I had to go on stage regardless. I teetered the head set on my ears and thought if I could just hold my neck a certain way, it would stay up for 5 minutes. Mid-pose, the head set fell off my head and crashed down to the floor. Except, before the microphone hit the floor, it passed briefly in front of my mouth long enough to hear me say “Craaaap!” Except…I didn’t say crap. I said, well, you know…starts with an ‘sh.’ Did I mention I went to a Christian college? It was awful. The whole room froze: staring at me because I just said an expletive. So much for relaxing, calming yoga! My face turned red, and I wrapped up my session early and slipped off stage. What does this have to do with peanut patties? Nothing, except that the color of these peanut clusters was the same color as my face that day. If you’ve never had this chewy Texas delight, it tastes a little like a homemade PayDay candy bar: peanuts encapsulated in a soft, creamy caramel. Peanut patties are some of the best things found in gas stations in Texas. This recipe requires a candy thermometer. Don’t be scared! Also, the red dye is optional. Dear friends, thank you SO much for the good wishes on our move! I have arrived safe & sound in the beautiful green rolling hills of north eastern Kansas. However, our stuff has not arrived from California, so in the meantime I have baked recipes ahead of time to share with you. I shared some photos of the house on Instagram if y’all are interested. Click here. Also, don’t miss the priceless moment my Dad caught on film last week: I found my dream wedding dress! 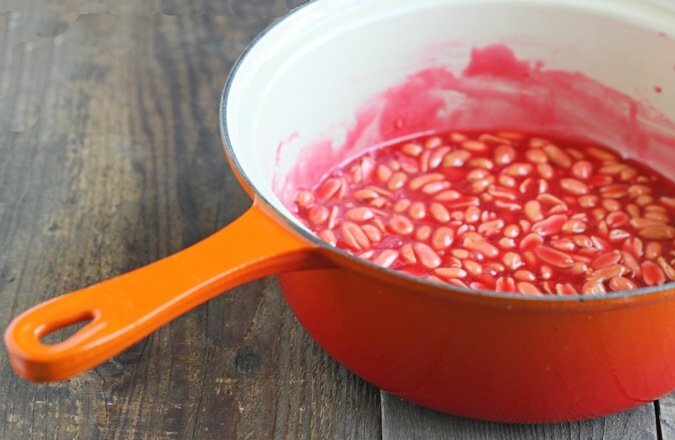 In a deep, heavy-bottom sauce pan (preferably enameled cast iron), add the sugar, peanuts, corn syrup, water and salt. Clip your candy thermometer to the side of the pan, but ensure the probe does not touch the bottom of the pan--you want it to hang slightly above for an accurate reading of the candy, not the pan. Turn the heat to medium, and begin to stir the mixture with a silicone spatula. Keep stirring while cooking until the mixture reaches 240 degrees. Immediately turn off the heat, add the butter, red dye and vanilla. Let the butter melt. Let the mixture rest and stir it every minute or so until it cools to 130-135 degrees. Meanwhile, have ready a sheet of parchment or wax paper. Once the mixture reaches 135 degrees, begin scooping it by the heaping tablespoon onto the paper. Work quickly before it sets! Press the mixture into patty shapes. Let cool completely on the counter, then wrap in plastic wrap for storage. Do not leave the patties uncovered--they will absorb moisture from the air and their texture will change. Keep tightly wrapped! Um, that would have made me want to be in your class even more! I could eat about 15 of these! Wowzers, look at that colour!! Love the sound of these! Can you believe I’ve never had a peanut patty?? But I’m addicted to Pay Day bars and these are pink, so…..they need to happen. I love that these are pink! Definitely not the picture I was expecting when I clicked over to your blog! They sound so good though! I laughed so hard when I read about the “craaaap” part. I would’ve just ran off the stage so I definitely commend you for staying strong. As for these homemade paydays, that pink is absolutely gorgeous. girl i was part of a college leadership thing at my church in college and totally did the same thing…no biggie ;) it’s a good conversation starter and let’s be honest – who doesn’t at least THINK those things from time to time?! Holy moly! I did a doubletake with these . So vivid – and they look delicious!! Now that is one bright color! I love it! These look so amazing, and I love the bright color. I am so glad you are here safe and sound and hope to see you VERY soon!! Love the color. I was laughing when you said there is no relation between the patties and the story, except the color of your face. Awww.. These looks super yummy! I’ve always loved a good Payday…will have to them out for the Hubs and me. P.S. That wedding dress photo on IG was beyond perfect! I can’t believe your dad caught the exact look of joy and emotion. I’m SO dang excited for you! The headset falling off plus the cussing in front of bewildered students is absolutely priceless. Probably not so funny to you, but I always love a good embarrassing story. ;) I’d definitely be down to take your yoga class…and down to try these peanut patties! Fun post. Cool, I’ve never seen anything like those! So glad the move went well. And I teared up a little when I saw the pic of you in your dress! I’m such a girl. I had a goats cheese, beet and quinoa veggie burger for dinner tonight that was exactly that colour.. only probably not nearly as tasty… I LOVE the sound of a peanut patty – it sounds so delicious. I also love that you have arrived safe and sound. I had more of your amazing pom jelly for breakfast this morning. Having something so delcious and so homemade just makes me smile every time I see the jar. Now I know what to make with the big bag of peanuts which our Mississsippi hunters bring us each fall. Sounds yummy! I’m glad you arrived safely, now hopefully the rest of your things won’t be far behind! Welcome to Kansas! My husband loves peanut patties, but they have to be “sugary” rather than chewy. Where do these wind up on the chewy to sugary scale? 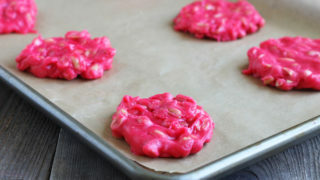 If chewy, what temperature should I cook them to in order to get that sugary texture? We do love being able to cook just enough of wonderful desserts – thanks to you! Haha! Thanks for sharing that funny story, Christina! We all have moments like that I guess, but perhaps not as humilating! Glad you can laugh about it now, though. Congrats on your wedding dress and a successful move! omg, girl! you found your wedding dress already?! i’m jealous! i haven’t even begun looking yet..i have appointments in june..will keep ya posted! i loved your story..hahahah moments like that are the best stories to tell :) love the peanut patties, they look so girly and fun! LOVE that picture of you in the dress! Amazing. And I love everything about these patties. Lol, Christina, I’ve seen these in Texas gas stations. ;) That picture of you was so touching… you’re a beautiful bride-to-be! Glad to hear you got moved ok, too — hope the rest of your household belongings catch up with you soon! I’ve never heard of this, but they look great…I’ll have to try them out soon! 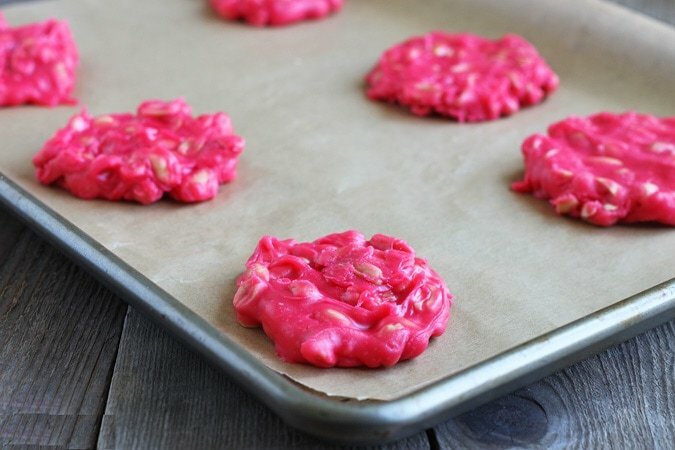 These peanut patties look delish, but the red color is totally throwing me off. Is there a reason to dye them red? Or just something you do for fun? hahah you are too funny. that’s okay, we’ve all had our moments. these look delicious; i love paydays!! This looks delicious and I absolutely love that it’s pink. Love the recipe, candy, and comments. I believe the red is necessary just as it is in red velvet cake. The tan ones just don’t taste the same as the red ones. For tan, I make peanut brittle so maybe the originator added the red so folks could tell the difference just by looking. Have eaten these as long as I can remember…and trust me…that is a long, long time. When I go to the Lonestar Steakhouse, I always come home with a small lunch paper bag full of fresh roasted peanuts. I just don’t add them until they won’t have to roast but will have time to warm up. Have been trying to make these for years with various recipes. This is the first recipe I have tried that really works! Follow it exactly and you will have the real Texas Peanut Patty! May be a little time consuming but don’t double, just make small batches. I’m originally from Texas &, other than family, these peanut patties & bluebonnets are what I miss the most. I will definitely be giving these a try. It’s rainy today, so will wait until it dries up a bit. I plan to enter them into our local fair, if the are as good as I remember. Can you remelt patties that didn’t set? Hi Paula, I haven’t tried that, sorry! I would do it over very low heat.